Warning! Discussion questions contain spoilers. Everything We Keep ended with James surfacing from the fugue state. What did you think happened next? Did you expect him to return to California with his sons? How do you think James handled his relationship with Aimee? Should he have pursued her, or was he right to let her go? Claire showed up in Mexico only to observe her son, but ends up not only interacting with him, she returns every summer and Christmas holiday. She obviously didn’t want Carlos to know who she was or else he’d send her away. Why do you think she kept coming back after the way she treated James? Were you surprised she was an artist, too? As Carlos, James put a huge burden on his son Julian. Not only did James prepare Julian for his possible change, but he asked Julian to help him become a father again. Considering Julian’s age at the time (eleven), did James do the right thing? If you were in a similar situation, how would you have prepared your children? Julian remarked that older brothers are supposed to protect their younger brothers. What do you think of Thomas and how he treated James? Were his revelations surprising? Do you think he had James’s best interests in mind? In the end, the reveal shows Phil had protected James. He warned him when to jump overboard. Did Phil’s actions surprise you? At the beginning of the story, James has lost so much: his childhood sweetheart, his career, and six years of memories. By the time the story ends, it’s apparent he’s gained so much more: a new love, two sons, and his art. How did this change him? What did he learn along the way? Many themes are presented in this novel: loss, love, resilience, family, forgiveness, and acceptance. Which theme resonated the most with you? The story ends with a mysterious appearance from Lacy, the psychic who propelled Aimee on her own journey. She gives James her business card. Whom do you think the card is for? What do you think James will do? 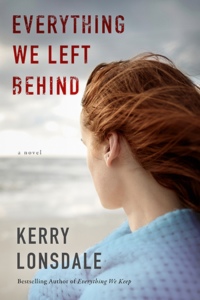 Sign up for Kerry's newsletter for exclusive details about upcoming book news, giveaways, and more.